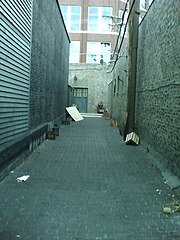 English: The alley where John Dillinger was killed, redressed for the film Public Enemies. This work has been released into the public domain by its author, Victorgrigas at English Wikipedia. This applies worldwide.